Senate Judiciary Chairman Chuck Grassley, R-Iowa, has requested a response from Christine Blasey Ford about whether she will testify before the committee. Grassley had called for Ford's attorneys to respond by 10 p.m. ET Friday to a request for her to testify before the panel next week. 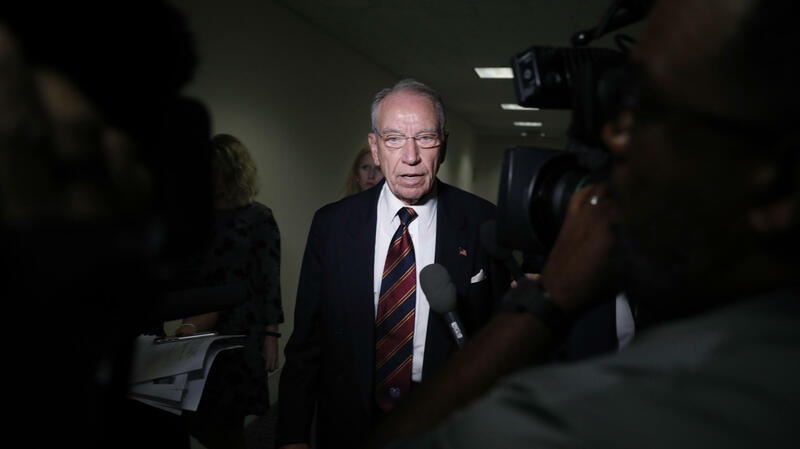 If they did not reply, Grassley said, the committee would move ahead with a vote on Kavanaugh's nomination on Monday. An attorney for Ford called the deadline "arbitrary" and asked that Ford be granted an additional day to consider her options. "[The deadline's] sole purpose is to bully Dr. Ford and deprive her of the ability to make a considered decision that has life-altering implications for her and her family," attorney Debra Katz wrote in an email to the committee's Republican staff. Shortly before midnight, Grassley tweeted that he had granted an extension, telling Ford he wants to hear her testimony. He directly addressed Kavanaugh in a tweet, too, saying, "I hope u understand. It's not my normal approach to b indecisive." The committee has asked Ford to testify about her allegation on Wednesday, Sept. 26. Ford's lawyers and Senate Democrats have pressed for more time, arguing the hearing should take place next Thursday, among other conditions. In a series of tweets earlier Friday, Trump cast doubt on Ford's charge, mentioning her by name for the first time: "I have no doubt that, if the attack on Dr. Ford was as bad as she says, charges would have been immediately filed with local Law Enforcement Authorities by either her or her loving parents. I ask that she bring those filings forward so that we can learn date, time, and place!" But according to Department of Justice statistics, as of 2016 only 23 percent of rapes or sexual assaults were reported to the police. "I know a lot of people that things like this have happened to and they don't talk about it. You're embarrassed and ashamed and you don't think people will believe you. So I don't think someone will believe you ... I don't think it's unusual at all that she didn't tell anyone back them. She did ... tell a therapist several years ago, and I know that was one of the things this summer, she was waiting to get ahold of them to see if they had written it down, because she wanted something to back up that she wasn't just making up the story right now. And so I know she was glad that the therapist did have notes on that." In another tweet, Trump said that "radical left lawyers want the FBI to get involved NOW. Why didn't someone call the FBI 36 years ago?" Trump's tweets follow an interview he gave to Fox's Sean Hannity on Thursday night in Las Vegas, where he appeared at a rally, in which the president first questioned why the FBI hadn't been called at the time of the alleged assault (which would likely have been handled by local law enforcement). "You say, why didn't somebody call the FBI 36 years ago?" Trump asked. "I mean, you could also say when did this all happen, what is going on? "To take a man like this and besmirch — now, with that being said, let her have her say and let's see how it all works out. But I don't think you can delay it any longer." In an appearance in Portland on Friday, Sen. Susan Collins, R-Maine, said she was appalled by Trump's tweet. "First of all, we know that allegations of sexual assault — I'm not saying that's what happened in this case — but we know allegations of sexual assault are one of the most unreported crimes that exist. So I thought that the president's tweet was completely inappropriate and wrong." Trump's tweets came amid ongoing negotiations over whether and how Ford and Kavanaugh might testify before the Judiciary Committee. The committee initially scheduled a hearing for Monday and had invited Kavanaugh and Ford to testify. In a letter to the committee, Ford's lawyers said that she would be open to appearing before the panel, but that an appearance Monday "was not possible." Ford's lawyers and Democrats on the panel want the FBI to investigate the charges — a move Grassley and other Republicans have dismissed. Ford does not want Kavanaugh in the room when she testifies, and her team does not want an outside questioner on the Republican side to be brought in, a source in Ford's camp tells NPR's Nina Totenberg. On Friday, Grassley's camp agreed to the demand that Kavanaugh not be in the committee room but rejected her request to only allow senators to question the two witnesses, saying it was within committee rules to permit staff attorneys to conduct the questioning. Grassley's Friday night letter to Ford's attorneys setting a deadline also rejected two key requests discussed in a conference call with committee staff from both parties on Thursday — to have Kavanaugh testify first and for the committee to subpoena other witnesses like Mark Judge. Ford alleges Judge was there at the time the incident took place when they were in high school. Ford says that Kavanaugh groped her and tried to forcibly remove her clothes during a house party in Bethesda, Md., in the early 1980s. Kavanaugh has denied the accusation. In another tweet Friday morning, Trump called Kavanaugh "a fine man," who he said is under assault "by radical left wing politicians who don't want to know the answers, they just want to destroy and delay." Trump continued, "I go through this with them every single day in D.C."
Senate Majority Leader Mitch McConnell, R-Ky., speaking to conservative activists at the Value Voters Summit in Washington on Friday morning, expressed confidence Kavanaugh would be confirmed. "You've watched the fight. You've watched the tactics. Here's what I want to tell you: In the very near future, Judge Kavanaugh will be on the United States Supreme Court," he said. Trump also lashed out at Sen. Dianne Feinstein, D-Calif., in his fourth tweet on the Kavanaugh nomination Friday, renewing his accusation that Feinstein and Democrats held a letter from Ford in which she first raised the accusation against Kavanaugh "only to release it with a bang after the hearings were OVER," which Trump asserted was "done very purposefully to Obstruct & Resist & Delay." Trump continued, "let her testify, or not, and TAKE THE VOTE!" Feinstein tweeted this week that Ford had sought confidentiality and "I honored that. It wasn't until the media outed her that she decided to come forward. "